Brooklyn Voices in Food is a weekly series on the publications, zines, websites, writers, artists and producers leading the conversation about food, cooking, media, art and culture in Brooklyn. Know someone who would be a great fit? Let us know! This week, we spoke with longtime Brooklyn food writer/editor Anna Dunn. Anna serves as Editor In Chief of one of the most original, inspired food publications we know: Diner Journal. Every time we leaf through the smooth matte pages, we can't help but feel inspired by the photography, the original artwork, the unusual stories and the unusually creative and reliable recipes. 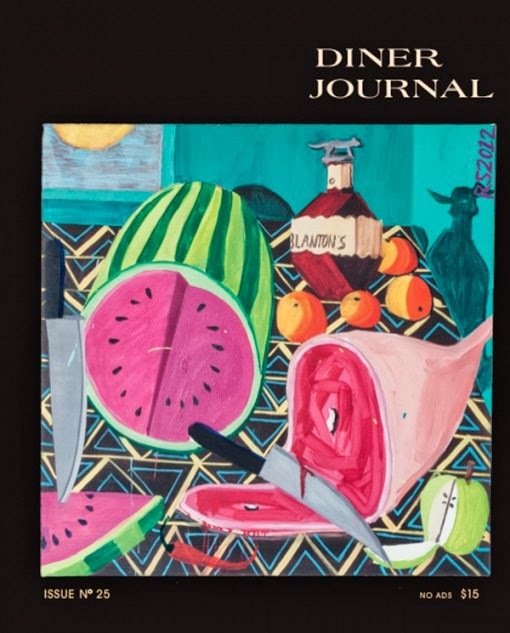 Each issue has its own character, and where other journals or magazines might become formulaic, Diner Journal keeps every issue original, bright and insightful. The covers alone (we've sampled a few of them throughout the interview) make it difficult to not pick up off the newsstand. It's exactly the type of food-meets-art-meets-culture publication we love to see. And it's right at home here in Brooklyn, where it has been published since 2006. 1. There are more food quarterlies, magazines and zines out there than any of us can keep track of. Tell us about Diner Journal. What makes it stand out? 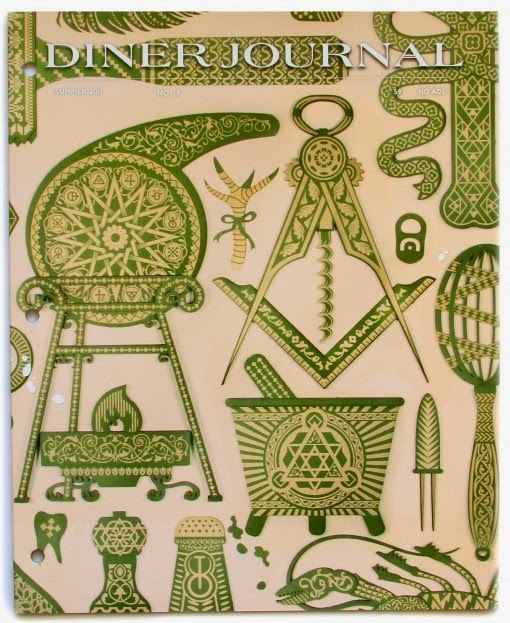 Diner Journal is certainly one of the oldest food journals around. Institutions like Gastronomica and Art of Eating really inspired us in the beginning and all the new journals continue to inspire us. It feels like a broadening conversation and it's exciting to be a part of it. We may be one of the few ad free journals and one of very few started by a restaurant. We also value the art as much as we do the content or the recipes which makes it really fun for us. We publish a lot of original art, poetry and fiction. It is just as important to us as the recipes and the food. 2. 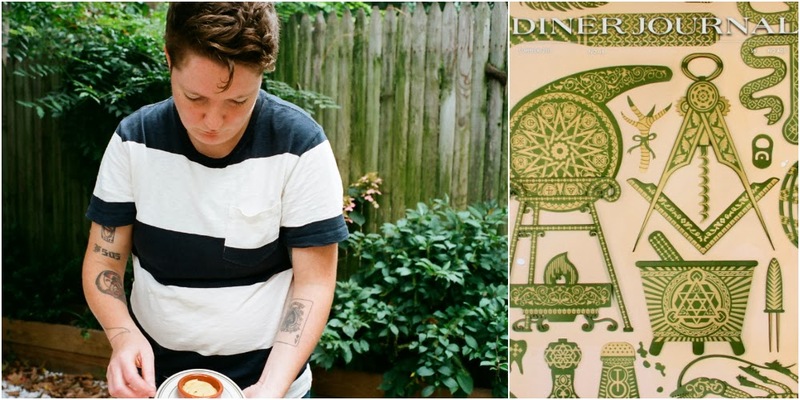 As a Brooklyn-based food publication, what does the local food culture add to Diner Journal? Local food culture has been very vital to the Diner Journal. In the beginning we really used the Journal as a means to learn more about our practices at the restaurants. We travelled to farms and slaughterhouses, butcher shops and cheese caves. Now in such a vibrant community (food and otherwise focused) there is never a drought of ideas, contributors, passions or curiosities to be represented in our pages. "Food is only different than art and writing because people can tell they need it on a basic level. We get hungry right? Well I think it's the same for art and creativity. We crave it. Food is a lens, a way for us to get at the ideas that inspire us." 3. The motto of Diner Journal is "Ad-free and three hole-punched since 2006." What have you done to keep the publication relevant in the seven years that it has been in print? I don't know that we have been very concerned in being relevant. Which is certainly a kind of fault of ours. We set out to make something thoughtful and inspired, something as an alternative to all those glossies that had become popular ten years ago. And I think we are lucky that it seems to have spoken to the food movement that was taking shape. Now we try and stay relevant by staying excited, or moved by what we are publishing—which is not always food related. 4. In fact, Diner Journal has been around a lot longer than many of today's Brooklyn-based food publications. What has changed in Brooklyn's food scene since you started Diner Journal? The food community has just taken on fire here in Brooklyn since we started. I feel so lucky to live among so many talented young producers, urban farmers, bee keepers, bartenders, chefs and butchers. 5. How did you become Diner Journal's Editor-in-Chief? I was working in the coffee shop at Marlow and Sons when Caroline Fidanza, Andrew Tarlow and Mark Firth started the Journal. Someone, I think Caroline, knew I was a writer (poet even?!) and I was invited to work a little on the first one. With the second I became the editor type of person on set and it has just evolved on since then. 6. Is there a story that you've published in Diner Journal that is particularly memorable for you? There are many stories in the Journals I think of and return to time and again. I loved Robert LaValva's story on the history of our seaport. He is the Director of the New Amsterdam Market and just a lovely writer. Later he and Caroline wrote each other letters about eggs that are surprisingly moving. Mateo Kehler writing about Jasper Hill Cheese Caves, sunshine and micro-finance. Caroline's long recipe for Ribollita. I make it every year for the vegetarians at Christmas dinner. Scarlett Lindeman and the Ham. Poetry and fiction by Peter Milne Greiner and Jess Arndt. 7. 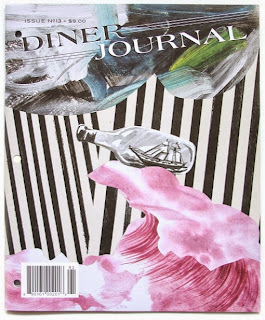 Can you walk us through the lifecycle of an issue of Diner Journal? The Journal is a constant conversation. Andrew Tarlow, the publisher and owner of Diner, Marlow, Reynard, Romans, Achilles Heel, etc, and I keep a running list of ideas or themes for a Journal. He likes to have four planned out in advance. Once we pick one and roll with it there are pitch meetings. After we get the content on lock down we have many late night editing sessions. There a handful of amazing people who work on the Journal issue to issue. Becky Johnson is Art Director. Julia Gillard is our photo editor. Scarlett Lindeman is our recipe editor. Leah Campbell, Sarah Wyman and Tessa Basore copy edit and basically give the thing legs. We all work other jobs, many of us in the restaurants. And then in the final days before we hit print, Becky and I sit in the office late into the night at Marlow and Sons obsessing over every detail, drinking Bud and finding typos. It's perhaps an imperfect system but one we return to every time. 8. You don't just publish stories but also original art, photography and recipes as well. Is it important that food publications participate in a larger conversation about culture and art? Food is only different than art and writing because people can tell they need it on a basic level. We get hungry right? Well I think it's the same for art and creativity. We crave it. Food is a lens, a way for us to get at the ideas that inspire us. 9. 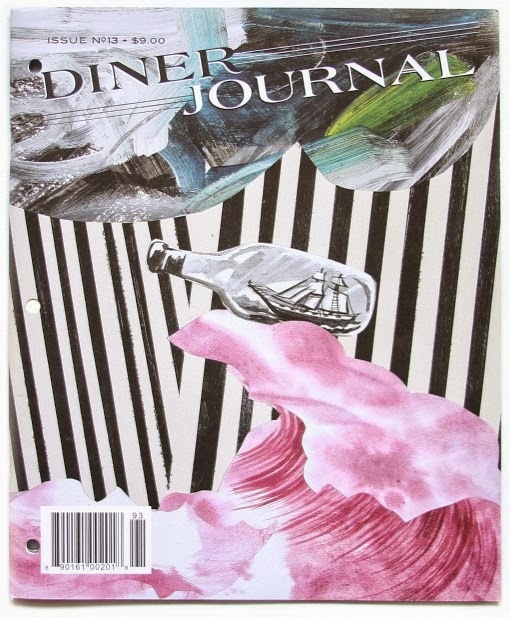 What's in store for Diner Journal's next seven years? And what do you think is in store for the Brooklyn food publication scene going forward? I have no idea. We try and stay present. I hope the food publication scene continues to expand and grow. All the emerging voices and points of view are really exciting. 10. Why is Diner Journal three-hole punched? So you don't throw it away. Anna Dunn is Editor In Chief of the Diner Journal and co-writer of Saltie: A Cookbook. She is currently enrolled in the Crime Fiction Academy at the Center for Fiction in hopes of some day writing a mystery novel—or seven. She bartends Saturday nights at Achilles Heel in Greenpoint and has one amazing wife and five pretty cool pets. Nice post.if OUTLOOK customer has many queries for 72744, here is the fixing of OUTLOOK error. This is a common problem for the customers at present days.you can visit outlook customer care keep posting. This blog shares some good quality information which is very useful for my project work.